Love paella? 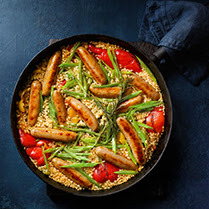 Then have a go at this spin on the classic Spanish dish using tasty chicken chipolatas. Save the extra oil from the jar of peppers and use in salad dressings or to fry vegetables. 1. Drain the peppers, reserving the oil. Heat 1 tbsp of the oil in a large frying pan or shallow casserole dish over a medium-high heat and fry the chicken chipolatas, turning regularly, for 8-10 minutes, until golden all over; lift out of the pan and set aside. 2. Add the garlic, tomatoes and paprika to the pan, season and fry for 2-3 minutes until most of the water from the tomatoes has evaporated. Stir in the rice, drained peppers and the runner beans, then tip in the chicken stock. Bring to a simmer, return the chipolatas to the pan and nestle in the rosemary sprigs. Simmer briskly for 10 minutes, then turn to the lowest heat, cover with a lid (or a sheet of foil) and simmer very gently for 5 minutes until the sausages are cooked through and the rice is tender. 3. Take the pan off the heat and rest for 5 minutes. Serve with lemon wedges and a green salad, if liked. Delicious served with a smooth red wine like rioja.